What causes shifts in the production possibilities frontier (PPF or PPC)? - FreeEconHelp.com, Learning Economics... Solved! 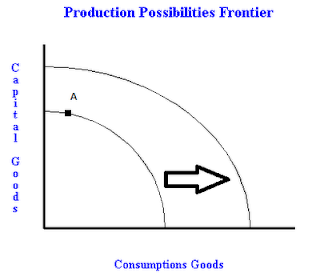 Home example microeconomics PPF trade What causes shifts in the production possibilities frontier (PPF or PPC)? Updated August of 2018 to include more information and examples. Previous posts have gone over the description and construction of the production possibilities frontier, but have always assumed that the PPF stayed where it was or that everything else was held constant. Keep in mind that some texts will call it the production possibilities curve (PPC) while this post calls it the production possibilities frontier. Both names describe the same concept. In the real world there are several events that can occur that would cause the PPF to shift, or cause changes in its shape. Point A shows a choice high in capital goods, which leads to large growth. Finally, we could add some dynamics into the shifting process by allowing for a choice between capital goods, or consumption goods and analyze how much the PPF shifts out. 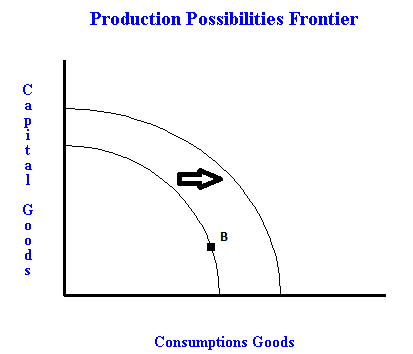 For example, if we choose to produce at point A (shown in the image to the right), then we will have a relatively low amount of consumption goods (pizza, clothes, parties, etc.) and a high amount of capital goods (roads, factories, schools and training), and this will cause the PPF curve to shift out quite a bit in the next time period. However if we choose to produce at point B, everyone will be happy because they will have a lot of consumption (which gives us utility and thus makes us happy), but in the future we won't have as many capital goods, so the PPF doesn't shift out quite as far. Point B shows a choice high in consumption goods, which leads to small growth. Some believe that the United States is at a point closer to B than A right now because of the small investment we are seeing in capital goods. Most people in the United States have a very small savings rate, and spend most of their money on food, entertainment, clothes, and other goods that need to be replaced every year. This means that less money is being invested in capital goods which can then be used to produced more goods in the following year. Additionally, when more money is saved, banks can use that money to invest in larger businesses or houses, which would be around for a long time and would increase our PPF by more. The movie below shows examples of shifts in the PPF or PPC. If you need help developing your intuition about why the PPF shifts this video can help cement that understanding. So, would a factor such a high unemployment shift the curve, or just mean we are operating inside the curve? It would mean you are inside the curve, as the PPC assumes full employment of people and resources. Great question, all resources have to be being used efficiency to be on the PPF so the fact that we have unemployment means that labor is not being used efficiently ---> inside the PPF. An example of a shift due to labor would be if labor someone became less educated or used technology/capital in the production process. Banning children/woman from the workforce would also cause an inward shift of the PPF. What happens to price of a product if we were to produce more capital goods than consumer goods? What ate the factors responsible for the construction of the PPF? If job training is given to the workforce what will happen to ppf??? @Akash, it will probably shift it out (like an increase in tech). So when its shown, where at what point would the production possibilities curve be shown at ? What would happpen if unemployment in a country is really high??? Vent for surplus means when an economy produces good more than that it can consume, i.e., it produces a surplus, this underutilization causes an inward movement on the ppf.... My question is, how does underutilization of surplus cause an inward movement on the ppf? If the ppc shift to right will it be parallel to the old one ? Does the points on the ppf move as well when the curve outwards/inwards? If the natural resources are decreasing and technology is increasing, in which direction should PPF shift? What would happen to the PPF if trade and specialization occurred??? The curve wouldn't shift, there would be I dot inside of the curve and that would indicate that you're being inefficient with your resources. Yeah, what the other Anon asked, would trade affect the production possibility curve by making it expand outwards? how the ppf affect a new mineral resource in the country? 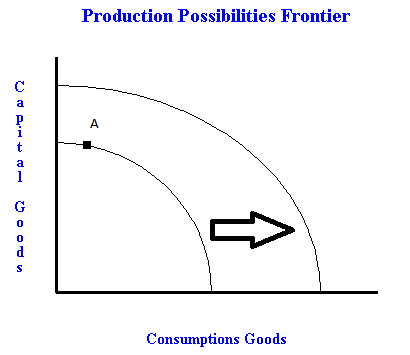 what would happen if the points are outside of the production possibility frontier and inside the production possibility frontier?